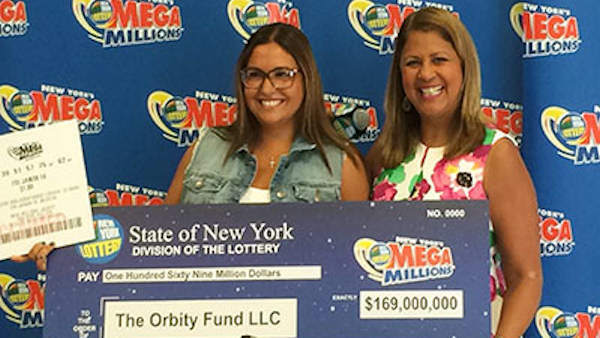 STATEN ISLAND (WABC) -- A homemaker from Staten Island has claimed a $169 million Mega Millions jackpot, and she has her husband's smart spending to thank for it. Like millions across America, Nancy Viola was caught up in Powerball fever in January 2016 as the jackpot approached $1 billion. And on January 8, she called her husband to ask him to purchase a few Powerball tickets on his way home from work. After stopping at the Foodmart on Victory Boulevard and buying the tickets, he realized he had $1 left over. So he decided to buy a Quick Pick ticket for that evening's Mega Millions drawing as well. The next day, Viola checked the Mega Millions ticket online. "The first thing I did was look at the Mega Ball, and the numbers matched up," she said. "Then I looked at the rest of the numbers, and they matched up too. I think I almost had a heart attack. I just couldn't believe what I was seeing, so I asked my husband to come over to look. He just kept looking at the screen three or four times, and he was in shock too." "There are no words to describe it," she said. "I still can't believe it. It's surreal, but exciting and wonderful at the same time. I've thought about my plans, and I want to make some investments and just be secure for the future."